A sign at the office of North Shore Recycled Fibers tells clients of a new policy: instead of paying for cardboard, the company will charge a penny a pound to accept it. [ad#250-left]I’ve had discussions about this with many people around the Kootenays including local waste management employees, regular recyclers, and elected officials, and I’d have to say that the majority of out-of-industry response on this issue is shock and disbelief. Shock that something as sacred as recycling may not be economically viable, and disbelief that I might suggest that putting this material into a landfill just might be the best short term option. This is predominantly because as a consumer culture this is a task that has been effectively marketed as a task at the household or business level, and the badge of “recycler” is proudly worn by many who want to participate in efforts to clean up the world – even if it is as innocuous as deciding to not place a jar in the bin, but washing it and storing it for recycling. These two R’s actually have much greater significance in the future economy than the idea that we can continue consuming as much as we are now, as long as we recycle the box that it came in. Recycling is the last “R” for a reason. 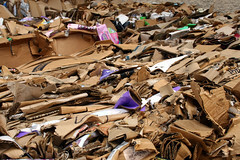 I’m not saying the future will (or should be) be devoid of recycling – rather the current mega-corporation model of recycling is probably not as sustainable as the companies that have cashed in on this the latest fad think it is. Communities need to focus on replacing many of the heavily packaged products that are commonly bought and sold at supermarkets with locally produced alternatives. Bulk grains instead of breakfast cereals, locally raised meat rather than prepacked frozen products. Locally baked goods, rather than breads and snacks suspended in a state of “freshness” by preservatives and airtight packaging. Local milk and juices in reusable containers rather than packaged drinks in recyclable containers. I can hear the cries of those accustomed to their urban or suburban lifestyle decrying this as an unnecessary inconvenience. I ask those who think the local agriculture is a waste of time to spend a moment considering where their next meal has come from, and how much oil or other fossil feul was required to grow, package, transport, sell and cook it – then look up Peak Oil and tell me how all of the heavily fueled activities can continue into the future with no viable replacement fuel or technology on hand or in research. All of this makes commercial recycling seem like a side business and a luxury we cannot afford to be solely focused on at the expense of the other “R’s”. What are your thoughts?